Oh, hello! I've been planning on doing a recap of my Vienna trip (which was incredible) but I can't seem to get my act together. Maybe this week? 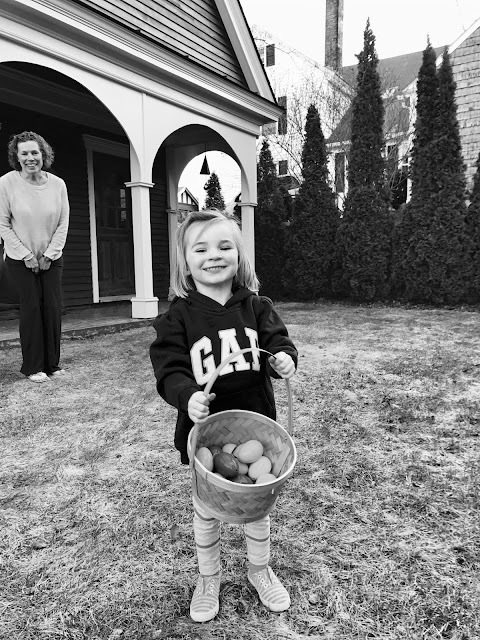 This weekend was a busy but good one--Friday night we did an egg hunt with my brother and his family and a certain 2 1/2 year old was rather pleased with the amount of peanut butter M&Ms that were included. We had Chinese takeout and it was so fun hanging out and catching up. On Saturday I did a little shopping with my mom and sister--we had a great lunch and I scooped up this dress which I realize is technically a coverup, but I'll be wearing it around town (sidenote: it runs really big). My sister got this jumpsuit and it's so good: super flattering and she says it's really comfortable. Sunday I did an early Pure Barre class and then had brunch at my parents'. We had Momofuku Birthday Cake as a pre-birthday celebration (thanks, Mom!) and it was delicious. I can't wait to eat the leftovers. The weather was perfect and buds are finally showing on the trees. I'm so glad spring is finally here and I plan on making the most of it. Here's to a good week! Proud egg hunter and proud grandmother in the back! Love that cover/up dress. Now I want to go to J.Crew ASAP!